Hormel Foods, the makers of Skippy Peanut Butter, recently introduced Skippy P.B. 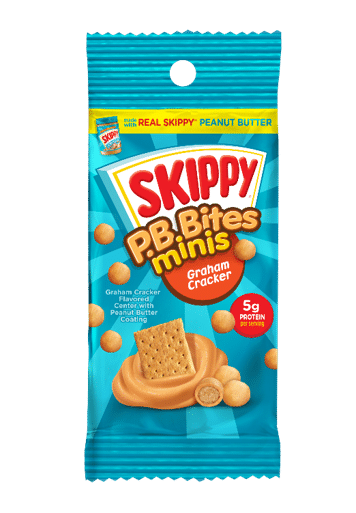 Bites Minis, made with real Skippy peanut butter, in two varieties: double peanut butter and graham crackers. The products come in 1.5-ounce pouches and are shelf stable. The products contain the following allergens: peanuts, soy, wheat, gluten and milk. The Skippy P.B. Bites Minis single serving contains 1 gram total fat, 10 grams saturated fat, 10 milligrams cholesterol, 150 grams sodium, 90 grams potassium, 18 grams carbohydrate, 1 gram daily fiber, 12 grams sugar and 6 grams protein. Skippy Peanut Butter, established in 1933, was recently cited on the Today Show as one of the 10 best peanut butters, which noted that the brand embodies the traditional flavor and reminds of people childhood.